Sophie and Max are the studio dogs for Studio1337. Extra points if you guessed they are Papillons! Sophie pretty much runs the place, making sure everyone has everything they need and is hard at work. She vigilantly guards the halls of Studio1337 from her strategic napping vantage point at the top of the stairs. Max seems to get a lot of attention, considering how lazy he is. He spends the whole day sleeping on the most convenient human he can find. He probably gets so much attention because he’s all of four pounds, and makes a whole lot of cute noises when he’s begging for a lap or having doggie dreams. Sophie joined Studio1337 in November, 2005, and Max came on board in January, 2008. The owners must have been pretty smart to choose such loyal, fun, cute and well behaved (ed: really?) 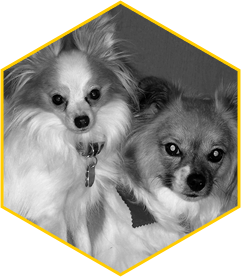 puppies like Sophie and Max, and you should really check out their Web design and Web development services to see how they can put those brains to work for you too!